During shelling, check for insects, webbing, or deposits, which are signs of worms (Illustration 130, 340). Check over the entire batch externally for signs of a worm having entered the almond (Illustration 131). If nothing is found in the external check, halve about 10% of the almonds and check them inside. If infestation is found in this sample, all the almonds should be halved. Minor scratching or missing parts of the thin brown peel are not a sign of infestation (Illustration 132). A. Strain through a mesh strainer such as a rice-strainer over a white surface. 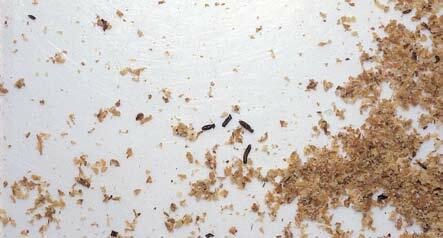 Check if there are small insects among the crumbs that have fallen through (Illustration 340). B. Spread out the pieces of almond that remained in the strainer on a white surface and check between them. If infestation is found, do not use the almonds. 130. Webbing hanging from almonds is a sign of moth larva infestation. 340. The powder that fell out when walnuts were strained, including insects and worms. Top inset: the insects magnified. 131. Almonds that were nibbled and punctured by moth larvae. In the center almond in the picture, one can see a moth pupa. 132. Almonds whose thin peel was damaged during the shelling process. Not a sign of infestation.